I read The Book of Dragons with Bookworm1 back in 2013 (linked to review). Our current science studies have been focused on dinosaurs and dragons so, to coincide with that, I pulled out our copy of this title to read it again with all of the kids. As mentioned previously, The Book of Dragons is a collection of 8 short stories about dragons. When I say short I mean "Nesbit in length" which means that a chapter could vary between 15-20 pages minus illustrations. Do be aware of that but also rest assured that Nesbit is so engaging a writer that even my four year old sat mesmerized by the stories contained herein. We read one chapter/story a day. At the end of each chapter you'd hear a chorus of phrases along the lines of, "I love this book." or "That was a great story!" Each of the kids had moments where they laughed and some where they were tense. Nesbit tells fantastic stories full of hard vocabulary words which stretch children and delight adults. Nesbit had quite the imagination and her stories take twists and turns that you don't always expect and which are intelligent in design. 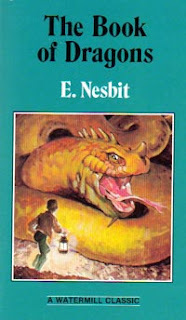 If you have a chance to read Nesbit aloud to your children, do! If you want to start out small, then we'd definitely recommend this collection. My favorite in this collection is The Dragon Tamers and I was amused when I went back to read my 2013 review and discovered I had quoted the exact same passage which stood out to me this time as well. Coincidentally, it's also the passage which made the four year old laugh! The other passage I marked down during this current read is from The Island of Nine Whirlpools. Apparently that was the second passage which made a mark on me during the last reading. I guess I just found those two stories rather clever and amusing! The Book of Dragons is a delightful read no matter how many times you read it. It's magical and fun. What other reasons do you need? I'm glad we re-read it. I suspect we'll do so again in another couple of years.